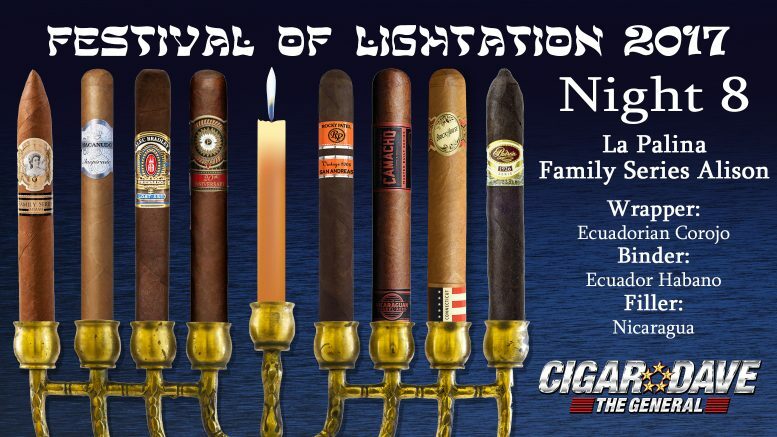 Cigar Dave’s 2017 Festival of Lightation will begins on Tuesday, December 12th, 2017 at 6pm ET and runs for 8 nights coinciding with Hanukkah. Each night the General picks a cigar to enjoy for the evening. You can find Cigar Dave’s nightly selections on CigarDave.com, Twitter, Facebook and Instagram. The La Palina Family Series Miami are smooth to the feel, firm, and exquisitely rolled, this medium-bodied gem delivers hearty notes of roasted nuts, cedar, coffee, exotic spice, and subtle hints of creamy caramel. Prensado Lost Art pays homage to not only its namesake, the Prensado, but also the lost art of handcrafting goods. Though automation has made it much easier to produce goods in mass quantities, it still takes a plethora of skilled artisans to create a premium cigar by hand. The Perdomo 20th Anniversary Maduro is hand-crafted with the finest tobaccos grown exclusively on Perdomo’s farms in Estelí, Condega, and Jalapa Valley. This cigar offers rich, elegant and complex flavors including espresso. The Rocky Patel Vintage 2006 San Andreas is comprised of an 11-year-old Mexican wrapper from the prominent San Andrés region, along with Nicaraguan fillers and a Connecticut Broadleaf binder. The result is a spicy, medium to full bodied smoke with a rich, leathery finish. The Perdomo 20th Anniversary Maduro features a barrel-aged Cuban-seed wrapper that surrounds a blend of zesty and full-bodied long fillers. It is lush, robust, velvety, with undertones of espresso and sweet spice. A mild bodied cigars offering a spicy and peppery smoke full of rich flavor. The refined tobacco in this box-pressed cigar is aged five years then blended to create an exceptionally smooth, complex, balanced, and full-bodied flavor. All cigars are available in both Natural and Maduro wrappers.